Want to engage with your children and help them think deeper? Discover amazing family conversation starters and questions that will ignite discussion and critical thinking. Conversations with our kids can sometimes feel repetitive, don’t you think? We ask, “How was school?” to get the predictable “Good” response. We might dive into asking what they did at school, which is better, but not by much. Beyond getting more than a one-word answer, I wanted to learn how to spur conversation with my kids to get them to think differently. I knew how important family conversation starters can be to encourage critical thinking, instill values, and offer a different way of seeing themselves. Once in a while, whether reading a book or listening to a podcast, I’d come across a recommended question to ask our kids. And each time, I would jot it down on my phone to save and use. Over time, I came up with six essential questions all parents should ask our kids and have compiled them below. I also explain the goal of the question, and how asking it can help develop confidence, gratitude, and a positive outlook within your child. In the sixth grade, my class had an assignment of drawing a poster of what we wanted to be when we grew up. But when the time came for me to draw a poster, I had no idea what to do. I remember panicking at the thought of not being able to turn in an assignment on time (yep, I was that kid). Finally, on the last day, I drew myself as… a paleontologist. Not because I had any interest in dinosaurs, but because the movie Jurassic Park was all the rage. We spend far too much time asking kids what they want to be when they grow up, when really, we should ask them how they want to change the world. After all, we don’t always have to identify with a particular career path. In fact, many different careers point to similar intentions. Maybe we shouldn’t focus so much on careers as we should on our calling. What is your child driven to do? How does she see herself making a difference around her? By talking about the impact she can make, she’ll be less constrained by careers and more focused on the mark she can leave on the world. Get tips on how to encourage your child’s interests. Breakfast can be the perfect time to engage in family conversation starters and topics, especially when you ask what your child is most excited about for the day. Why is this question important? You’re encouraging your child to think and act positively throughout the day. According to The Code of the Extraordinary Mind by Vishen Lakhiani, imagining the “perfect day” helps us stay positive, even when things go wrong. So, imagining positive outcomes doesn’t mean everything goes perfectly, but it does encourage us to weather negative events much more smoothly. For instance, if your child is excited about going to the park and imagines a wonderful time, she’s less likely to throw a fit if another child cuts in front of her on the slide. Asking her what she’s excited about also extends the positive feelings not just to the moment itself (time spent at the park). She’ll also be excited about it beforehand as she’s anticipating it (waiting at home until it’s time to go). This is a fantastic question to ask at dinner or bedtime, whether your child’s day was mundane or extraordinary. She falls asleep with a positive picture of her favorite part of the day, helping her have a good night’s sleep and feel satisfied with how the day has gone. Asking her favorite part of the day also helps her focus on the positive things that happened, even if not-so-happy things did as well. This doesn’t mean we brush difficult feelings aside (as you’ll see in the next question), but you help her remember that good things do still happen. And finally, she can begin to determine her interests and passions. She can learn more about herself as she notices that she tends to mention “painting at school” or “eating with family” over and over. Get 31 conversation starters for kids. We all have hard days, kids included. Encouraging your child to talk about her challenges shows that you’re open to listening to even her not-so-good days. That you’re not always expecting her to have a wonderful day, or get discouraged if she happens to have a hard one. Your child also learns how to focus on getting through challenges instead of dwelling on them or letting them sour her for a long time. Not only are you asking what was hard, you’re showing that you’re curious about the ways she overcame obstacles. And finally, you’re able to celebrate her grit and perseverance, two crucial skills she needs to thrive. For instance, my son admitted, after I asked him this question, that he had a hard time stringing beads onto a shoelace at school. Then he proudly said he had kept trying until he figured it out. Read more about raising kids with grit and perseverance. Gratitude can make a powerful impact on how kids view the world. They go from a “scarcity mindset” of never having enough, to an “abundance mindset” of realizing how much they have. I know it has for me. Ask your child what he’s grateful for in his life. He’s reminded of all the wonderful things he has, from his parents to his house to his favorite toys. You can also talk about his day and have him share which part of it he’s most thankful for. It might be the special trip to the ice cream store, playing checkers with the family, or eating his favorite pasta dish. Gratitude shifts our thinking away from the empty feeling of lack, to genuine pleasure in living in the moment. 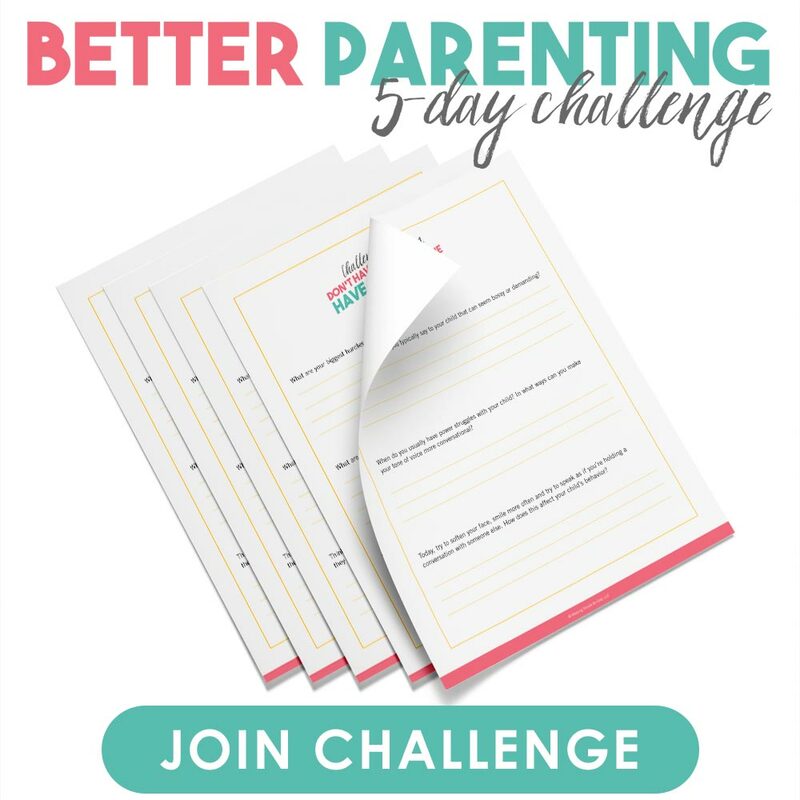 I highly encourage you to practice this question not just with your child, but with yourself as well! 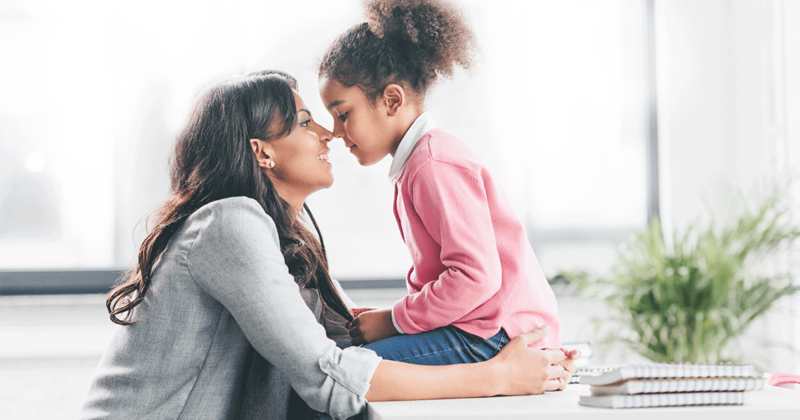 Get more tips about encouraging gratitude in your child. I’ll be honest: I never thought to ask this question in the past. I assumed it would breed self-conceit and entitlement in my kids, where they think they’re better than everyone else. But as I read more about self-love, I realized how powerful it is to equip our kids with the ability to truly love themselves. For one thing, having self-confidence can help keep limiting beliefs, doubts, and criticisms at bay. Kids can also turn into themselves, remembering what’s awesome about them, when they feel down. And at the end of the day, all of us need to love ourselves in order to give love to others. 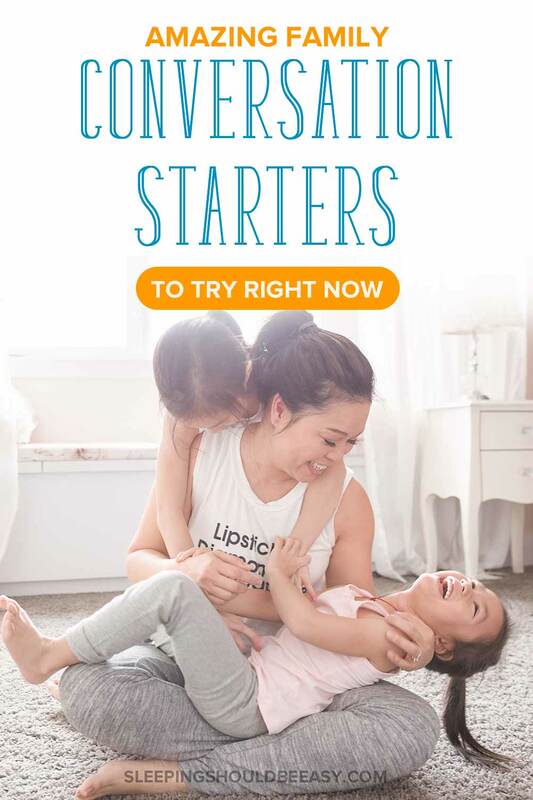 These family conversation starters not only spark interesting discussions, but also help your child grow into a wholesome person. Asking what she’s excited about for the day helps her stay positive and weather even the downsides of her day. Talking about what was hard develops grit and perseverance, while remembering what she’s grateful for fills her with a feeling of abundance. Sharing her favorite part of the day is a fantastic way to end it on a positive note, while talking about what she loves about herself reinforces the confidence she has. And finally, asking how she can change the world—rather than simply what she wants to be when she grows up—opens the doors to all sorts of possibilities and different ways to leave a mark. Start with these six questions, but most importantly, follow your child’s lead and keep the conversations going. There’s always something to learn with these family conversation starters. At least now you won’t be stuck with “How was your day?” and the always predictable “Good” as your only response. Want a Child Who Can Think Critically? Start with This. Tell me in the comments: Which of these family conversation starters will you try tonight?